It’s a weekday so there aren’t many people hanging out at Harmony Brewing today, and the rain has probably deterred walk-ins. A greeting is shouted from the bar, encouraging us to sit anywhere we like. We try one of the booths, but it’s too tight so we commandeer a four-top, sitting side by side on an old wooden bench. Even though Harmony’s only been around for about a year and a half, it exudes the ease and comfort of a college town haunt. Everything is a little blurry. No, I haven’t been drinking yet. My eyes were dilated earlier, at the first optical appointment I’ve had in recent memory. Though the day is dim, light infiltrates my freakishly enlarged pupils and makes it difficult to read the beer list. Furthermore, our waitress is clearly taken aback by my zombified gaze. After serious squinting, I get a pint of the Brewer’s Grove Dryad Ale brewed with Linden flowers from nearby Wilcox park. At only 4.4% ABV, you can drink it all day long, but this is no substandard “session” beer. A well balanced hop and malt backbone give it body to spare, plus a dry finish. For my second brew, I opt for the Beach Wedding Saison, a sweet, malty Belgian style ale with a juicy, fruity aroma that goes down way too easy at 7% ABV. Ordinarily, if I know I’m going to order pizza, there’s no way I would order bread sticks beforehand. What’s the point, right? Well, I’m really glad Juliet placed the order before I could dissuade her. 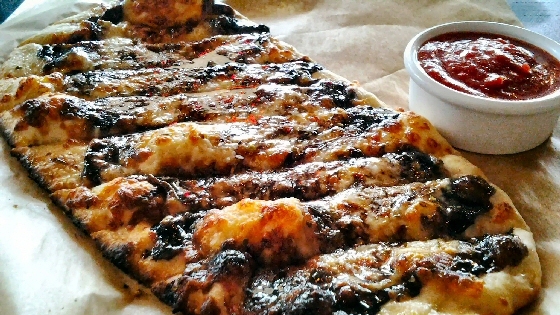 The hand-tossed dough is soft, with just a little crisp, topped with cheese, oregano, sea salt, and balsamic. It’s sweet, tangy, and yeasty all at once. Dipped into the homemade tomato sauce adds another layer of acidity, but I’m happy with our without the sauce (which is something you rarely hear me say; I’m a sauce hound). Harmony’s version is much more sophisticated. A thin crust—the dough second only to The Mitten Brewing Company’s, in my opinion—comes topped with crumbly nuggets of mild pork sausage, tangy goat cheese, strips of fresh basil, and chunks of charred pineapple. Each savory-sweet bite is enticement for the next slice. My only complaint is the kitchen could use a sharpener on the pizza cutter, so we didn’t have to risk blisters tearing apart the clingy triangles by hand. Distribution of pineapple could have been better as well. Both of these are minor complaints, compared to the overall pleasure I extracted from the meal, though. When the pie pan is empty, we pay up and head back out into the drizzle. Harmony was the perfect choice for a rainy afternoon lunch. Next time, I'll try the new sandwiches other customers were raving about. After months of listening to Jeremy rave about Harmony Brewing, the stars have aligned and we’re both in town and available for lunch. Beer and pizza it is! Only, I’m not much of a beer drinker, so I decide to go with a cider. Harmony has two on tap; one that’s bourbon barrel aged and one with ginger. I opt for the second and our server warns me it’s full of fresh, sharp ginger flavor. I love ginger beer, pickled ginger with sushi, and spicy gingerbread so I go for it and am not disappointed. The cider is sweet but tart with a bit of bite and heat from the ginger. We are both starving after spending this morning doing household chores and running errands, so I order us up some Cheesy Breadsticks with our drink order. Frankly, we have yet to find anything that can beat Bilbo’s (Kalamazoo, MI) Cheezy Stix with Creamy Dill Dip, but I’m always the optimist, keeping an eye out for a better breadstick. They arrive within minutes of our drinks, smothered in cheese, sprinkled with oregano and sea salt, and drizzled with syrupy balsamic. While I’ll still claim Bilbo’s sticks as my all-time fave, these might be my new local favorite! They’re served with a cold side of tomato sauce, but I prefer them as is, sans the sauce. Jeremy’s had several of their pizza varieties and offers his opinion on each. The vegan one, named the Slide Whistle, sounds interesting with white cannellini bean sauce and artichoke hearts. Also, the Good Earth—chock full of veggies and jarlsberg cheese—intrigues me. But in the end, the Aloha Goat wins my vote with sausage, goat cheese, fresh basil, and charred pineapple. The pizza arrives just as I’m draining my cider. The ginger was great, but I’ve got to try the bourbon barrel aged one next. This one is more tart than the ginger cider and the barrel aging has softened its edges and given it a woodsy, boozey complexity. Sipping this at lunch could be dangerous on a rainy day like today! I try to grab a slice of pizza, but the kitchen didn’t cut all the way through the crust. We had the same problem with many of the breadsticks too, forcing us to use our (very, very dull) knives to try to cut the slices apart. The pizza sauce and cheese burns my fingertips as I curse under my breath. To add insult to injury, our server watches us struggle with the pizza and our knives from behind the bar...and doesn’t offer to take it back to the kitchen for proper slicing. Missed opportunity. Eventually I wrestle a wedge free and take a bite. The thin crust and savory red sauce are a good canvas for the flecks of sausage and goat cheese. 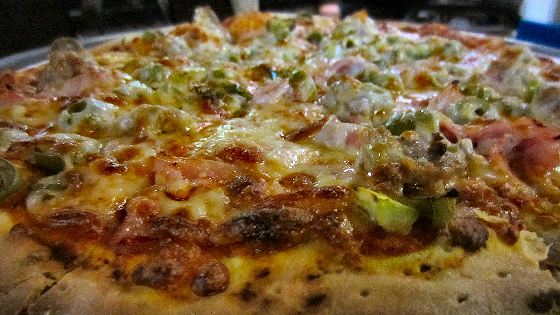 The addition of julienned basil adds a whole new layer to the traditional “Hawaiian” pizza. My one wish is that the charred pineapple would have been cut into smaller pieces and distributed more evenly on the pie. There are six slices of pizza and only four of them have pineapple...one very large, piping hot charred strip of pineapple. I mention to Jeremy how fun it would be to come back on a sunny day with a group of friends to sit on Harmony’s patio and share a bunch of pizzas. Their list of beer cocktails deserves exploration and I can always bring a pizza cutter from home!